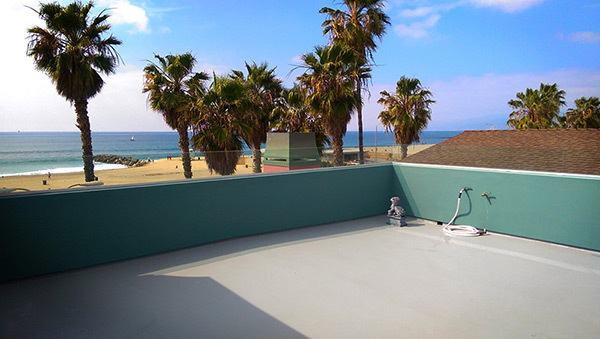 Waterproof Deck Coating on a balcony in a beautiful location on the coast of Southern California. Got Decks? If so, SCD has got the right deck coating to meet your needs. 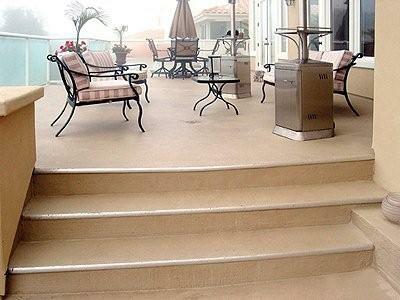 We are certified installers in Southern California of some of the best deck coating systems available, including the Mer-Ko ( a.k.a Mer-Kote systems), which is important to you, the consumer, because different applications will require the installation of different coatings. Without having a contractor that has a wide array of coatings to choose from, you never know if you’re getting the right material for your project, or simply the only material that the contractor may be approved to install, or knows how to install for that matter. We have an example of the wrong way to apply a deck coating at the bottom of this page. 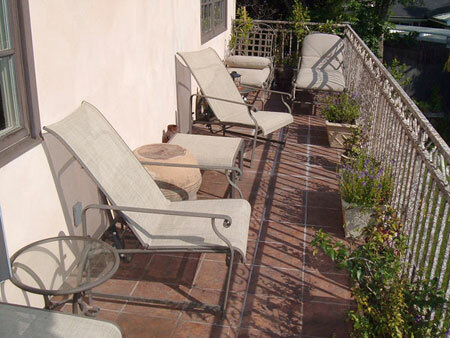 We do waterproofing and coating work throughout the entire Southern California area including construction, below grade, roof repair, balcony coating, epoxy coating work, pool decks, balcony, walkway, vehicular, and deck waterproofing / coatings. 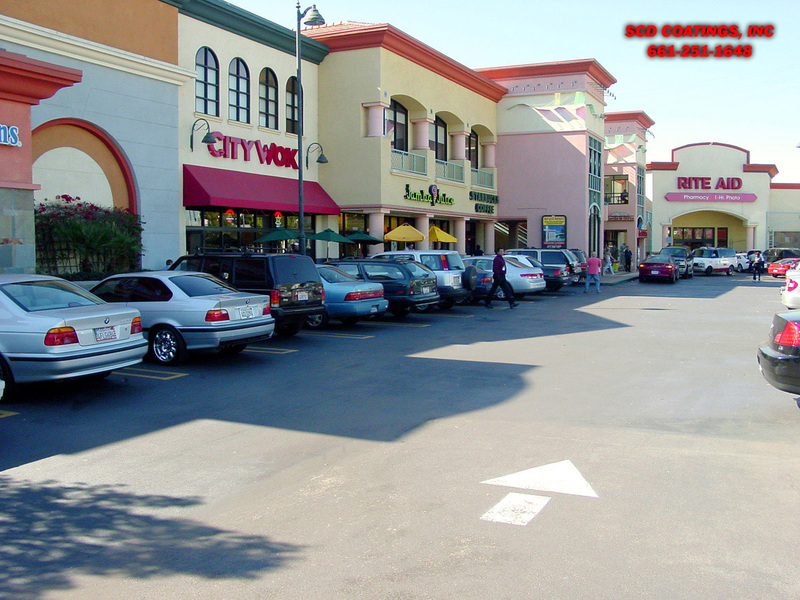 Maintenance, repairs, and new installations in West Los Angeles, the San Fernando Valley, Santa Monica, Orange, Riverside and Ventura counties are some of our local specialties. 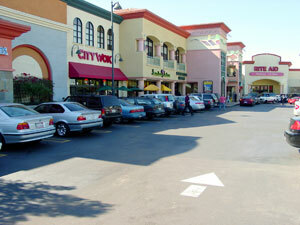 SCD used a Vulkem vehicular parking deck system for decorative and functional purposes, preventing water from leaking into sub-terrainian parking strucure. This job was done in Los Angeles by SCD Coatings to repair a failed coating installation and the surface is now impurvious to water penetration and the "Tudor House Brown" color adds beauty to the surrounding buildings. 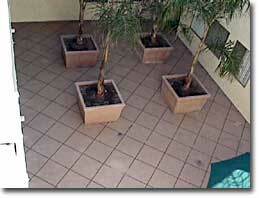 SCD's Fiber-Flex with tile-look finish installed in a courtyard. SCD can do all home, business and new construction. Pacific Polymer's 5000 H.T. 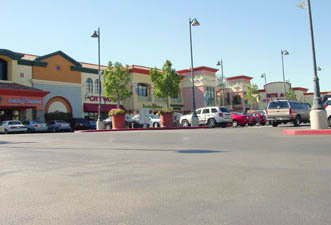 vehicular traffic coating on a large retail parking deck over a subterrainian garage structure. 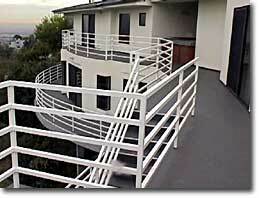 So if you have decking work, protect your investment with a coating installed by Southern California Coatings, Inc. Please feel free to contact any of our references as well as to take a look at a few of the installations on our more popular products. 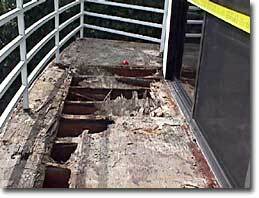 An exposed dry-rotted substrate caused by improper deck coating installation. in a house in the Hollywood Hills, CA. 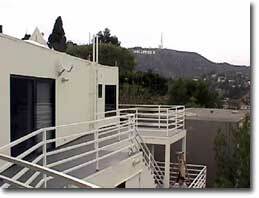 A great product we install is the Weather Deck System by Mer-Ko. 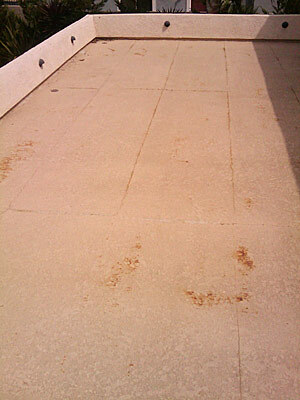 Weather Deck is a multilayered latex mastic roofing system which is trowel applied to a “floating” base sheet. 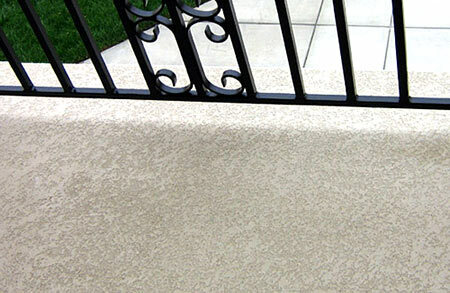 This system provides a slip resistant, waterproof walking surface that is isolated from substrate cracks. Waterproof flashing for drains, vertical surfaces, thresholds, as well as stress relief for thermal expansion are incorporated into the system. The thickness is approximately 3/16"-1/4" (4.7 mm-6.35 mm) and presents few elevation problems at doors, landings, steps, etc. 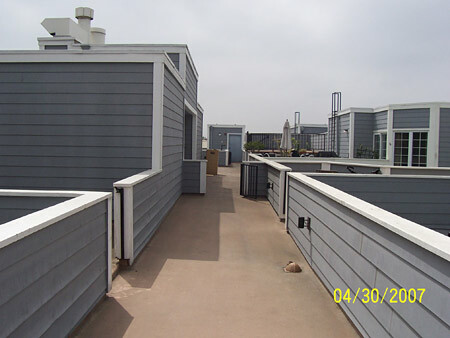 Flat roof decks, observation decks, various other deck coatings and balconies on commercial and residential buildings carrying pedestrian traffic. (For vehicular traffic, refer to Mer-Kote AutoDeck). • Monolithic, contains no joints or seams. • May be installed over any sound, solid, dry subsurface. • Fire retardant-One Hour Fire Rated – See “One Hour” Assembly Addendum. • Will not soften under extreme solar temperatures. • Installed only by qualified applicators. • Not designed for vehiclar or heavy steel wheeled traffic. • Subsurface must be dry before and during application. • In cold climates, consult manufacturer for specific requirements. • Not for use over OSB board. • Subsurface must be smooth. If not corrected, irregularities will reflect on the Weather Deck surface. For example, if a quarry tile deck has irregular grout joints which are not smoothed with underlayment, the grid pattern will show on the Weather Deck surface. • Minimum standards for wood surfaces are 5/8" exterior plywood over 16" o.c. joists or 1/2" exterior grade plywood over sheathing. • To insure perimeter flashng is installed per Mer-Ko specifications, please contact the Mer-Krete Systems/ Mer-Ko Materials a division of Parexlahabra office. 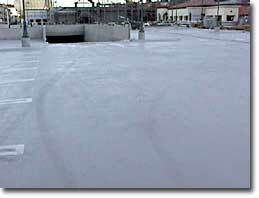 • In freezing climates, sufficient pitch is required to insure run-off. When covering a “sandwich slab” or quarry tile deck, provision must be made to vent the envelope created between the existing vapor barrier and the Weather Deck. 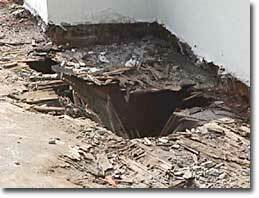 • Drains must be of a design suitable to receive Weather Deck flashing (i.e. J.R. Smith DX-1240 series). 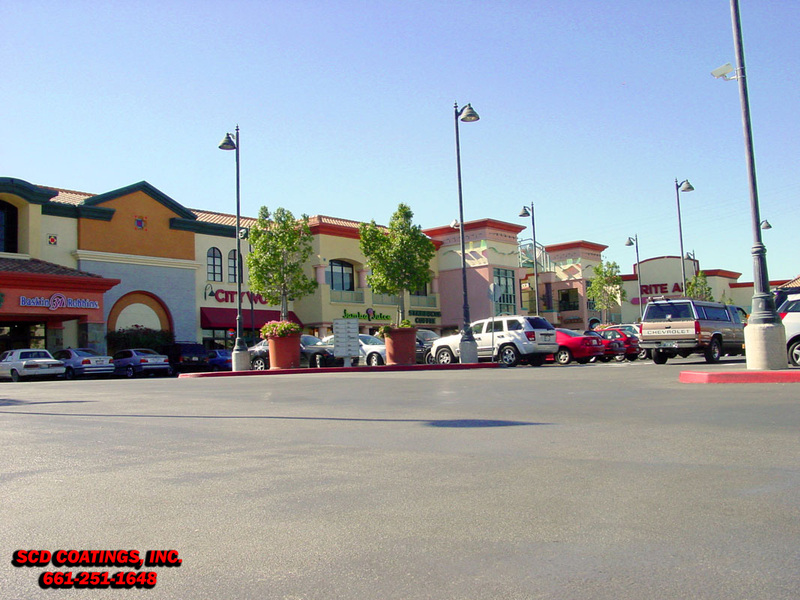 • Concrete subsurfaces must have a minimum compressive strength of 1000 psi tested by “point loading” technique. • The moisture content of the substrate should be checked and approved by authorized Mer-Ko installer prior to installation. • When contemplating a deck installation with an open soffit, or over an unheated enclosed space (i.e. garage, etc.) in freezing, damp or severe climates, consult manufacturer for recommendations. 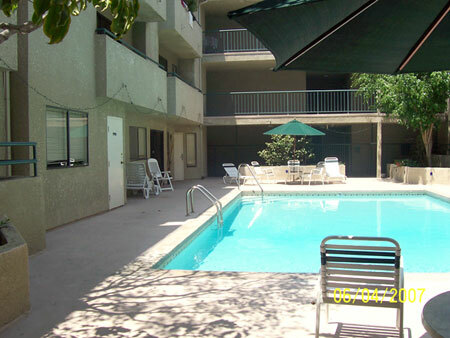 a multi unit complex in Sherman Oaks. SCD has the products and experience to provide leak free project every time. on a balcony in Santa Clarita, California. That is a great shot of one of the available textures we can apply for a deck coating. we fixed with a below tile waterproofing system. (type of) surface on a pool deck in Hollywood, California. 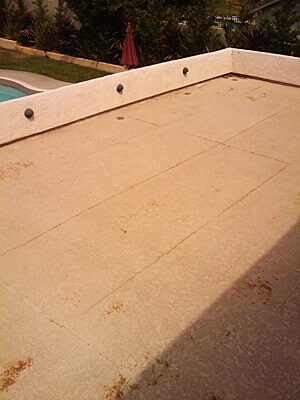 See more examples of Swimming Pool Deck Coatings here. WANT TO SEE WHAT NOT TO DO? Here is a job we went to bid on where the previous company that installed the original deck coating tried to save money and shortcuted the job by never integrating the waterproof membrane properly. Therefore water saturated the plywood and the wire lath and began to rust and dry rot all the plywood and soak through the surface which required removal and replacement of the sub-structure. Don’t be fooled. 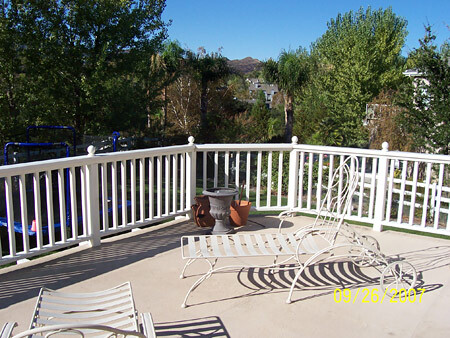 Ask Southern California Decking how to show you the right way for it to be done. We will even be happy to review an existing bid for a job you are planning.